Dora the Explorer fans are sure to celebrate with this holiday themed 3-DVD collection that includes Dora’s Big Birthday Adventure™, Dora’s Halloween and Dora’s Christmas. There is over 4 hours of adventures featuring Dora, Boots and friends. My children ages 4 and 5 are really enjoying watching this holiday set. I appreciate that although it is entertaining, it is also educational for preschoolers who learn valuable language skills, math and logic and interpersonal skills too. They also love to sing and dance along with new songs and take part in the festivities. This is a great way for young Dora the Explorer fans to be able to enjoy their favorite holiday themed episodes throughout the year. It would be a wonderful gift idea and is affordably priced at only $19.99 for 3-DVD gift set. 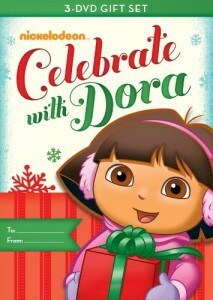 You are invited to purchase Celebrate with Dora™ online at nickshop.com or Amazon.